The plantar fascia is a broad, thick band of tissue that runs from under the heel to the front of the foot. 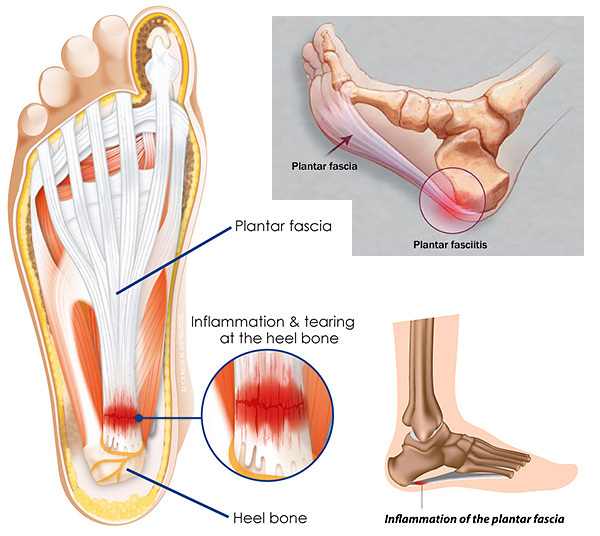 Plantar Fasciitis is an inflammatory condition of the plantar fascia located on the plantar surface of the foot. The inflammation of the band causes pain at the bottom of the foot and/or deviated walking patterns because partial microtearing of the plantar fascia occurs. The planter fascia plays a functional key role for running, walking, and other aerobic activities. It acts like a powerful shock absorber and spring that helps propel the foot forward during all stance phases.